سلام به همگی دوستان , امروز براتون یک اسکریپت آماده کردم که واقعیتش نمیدونم چی هستش , من که حدس میزنم یا یک سیستم مدیریت محتواست یا یک جامعه مجازی البته شاید حدث من اشتباه باشه . در ادامه مطلب توضیحات انگلیسیش همراه با دموی آنلاینشو قرار دادم . دوستانی که اش سردرآوردند لطفا در قصمت نظرات بیان کنند تا مطلب تصحیح گردد . 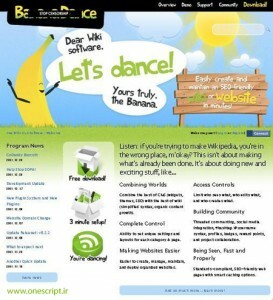 Banana Dance by Ascad Networks, is an open-source PHP/MySQL-based program. It is designed to combine the simplicity of wiki-publishing software with the versatility of a CMS. The program also promotes community-building through organized and user-rated commenting features. Highly flexible with theme-integration and extension availability Banana Dance can be used for all types of purposes, whether it be to create an entire website, a product owner's manual, or an "article"-posting site. دوستانی که چیز بیشتری از بنده فهمیدن در قسمت نظرات بیان کنند .